Photographer John Margolies spent nearly 40 years documenting what we now know as “roadside Americana”—the gas stations, motels, drive-ins, and diners that attracted road trippers with quirky signs and kooky architecture. In 2017, a year after Margolies died at the age of 76, the Library of Congress made its Margolies holdings available online—more than 11,000 color photos of food-shaped restaurants, catchy neon signs, and an intriguingly large number of dinosaurs. Margolies photographed the pink-hued Brontosaurus at the entrance to Florida’s Gatorland parking lot. At Myrtle Beach’s Wacky Golf, he captured a dinosaur marauding through a landscape crowded with a windmill, a sphinx, a church, and an assortment of cacti. And on Colorado’s State Highway 64 he shot a stegosaurus loitering outside a town hall, smiling slyly at the camera. The photographs have other similarities, too. They’re all taken under clear, blue, often saturated, skies. They are devoid of people. And they’re perfect examples of what Margolies became renowned for: photographs that celebrate the vernacular of America’s highways and byways, and elevate its quirks to a kind of high art. Margolies’ love of the road was a lifelong affair. As a teenager on family trips, he was drawn to the places “where everything was screaming for attention: ‘Look at me. Look at me,’” he recalled in a 2015 interview with the Washington Post. In the early 1970s, he returned to the road, in a rental car, with a 35 millimeter Canon FT camera and the mission of documenting the architecture that many consider tacky. Margolies had specific views about how his photographs should look. “I want these to be timeless pictures without identifying details,” he said. He kept a broom in his car to sweep debris from his frames, and waited for good weather. He traveled alone, for weeks on end, ultimately racking up more than 100,000 miles. 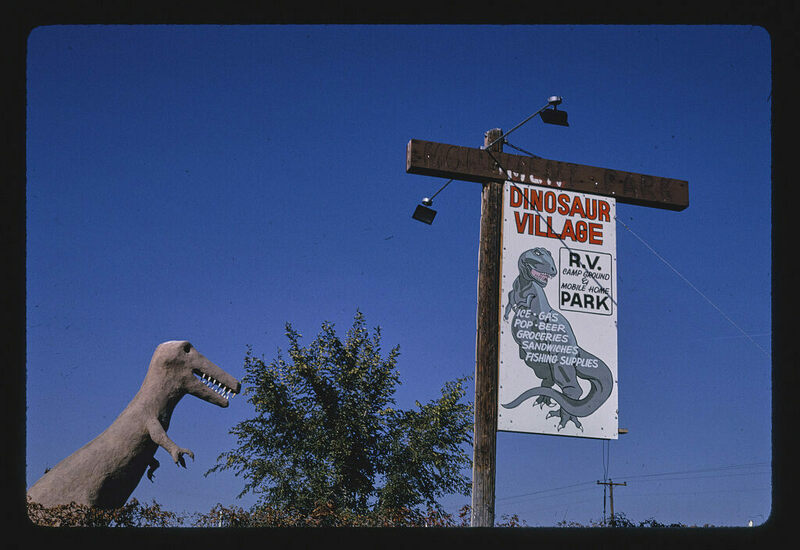 Some of the dinosaur-related locations that Margolies photographed remain open, including Michigan’s Dinosaur Gardens. Located near Lake Huron, this dinosaur park not only has concrete dinosaurs, but also Ice Age–era humans and a statue of Jesus Christ holding the world. Other sites survive but are now abandoned. Atlas Obscura has a selection of images from Margolies’s quest to find the “deepest nowhere,” and the strange, garish beasts that he found there.